Thank goodness for the gym! Before the holidays, during the holidays, and after the holidays, there's no shortage of cake at our house. With many birthdays surrounding and infiltrating the holidays, eating cake becomes almost a daily event in our household. Along with festive holiday cakes, decked out with sparkles and frosting, we had several birthday cakes, including NY cheesecake, and chocolate cake with butter cream frosting. I didn't bake any of these cakes, although I do have a recipe for an amazing carrot cake (originally from San Francisco, I believe) that I made for a birthday in October. If you bake this cake, your home will smell like heaven. I may make this cake again soon, for my daughter's upcoming birthday (more cake!). Preheat oven to 350º. Butter and flour or spray a bundt cake pan. (Although it can be tricky to remove cake from a bundt pan--grease generously--I like to use this type of pan because the cake is already in sections for neat cutting.) Thoroughly stir together dry ingredients--flour, sugar, baking soda, salt, and cinnamon--and set aside. In a large mixing bowl, beat eggs until frothy, then slowly beat in oil. Gradually add flour mixture, beating until smooth. Add grated carrots and blend. Pour batter into cake pan. Bake for about 30 to 40 minutes, or until a toothpick inserted into cake's center comes out clean. Cool cake in pan for 10 minutes, then gently remove from pan, invert, and cool additionally on rack. While the cake's cooling, blend together the first five ingredients to make the frosting. Frost cake when cooled. Garnish with pecans if desired. 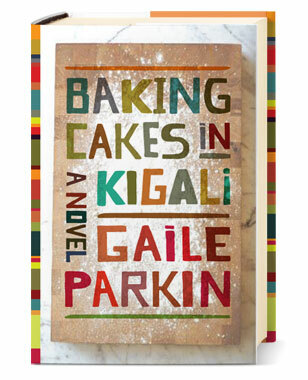 For another take on cake, please visit Lost in Fiction for Lucy Hannua's enchanting interview with Gaile Parkin, author of Baking Cakes in Kigali. Appearing on random Tuesdays, Really Random Tuesday is a way to post odds and ends--announcements, musings, quotes, photos--any blogging and book-related things you can think of. If you're inspired by this idea, feel free to copy the button and use it on your own blog. Please leave a link in the comments if you’re participating and I'll add it to this post. Thanks for reading! We didn't have cake over the holidays - only cookies - so maybe I'll bake that cake too! Thanks for the recipe. oh my gosh, I could live off of cake. (except carrot cake...I don't like carrot anything, even cakes...lol) I have such a sweet tooth though and do love cheescake with strawberries on top. Sounds like a good recipe. I used to love carrot cake! Been a while since I had one, though. We are a big dessert family (sometimes more desired than the main meal). Carrot cake is a favorite, so I MUST try this recipe. Thanks so much as it sounds heavenly. The book sounds very interesting. Shall check out the storyline soon. I adore carrot cake. Will have to try your recipe--sounds scrumptious! Happy happy 2012, Suko! I like carrot cake. I'll have to remember this one next time I do some baking. Yum, cake. I'll put on my coat and be right over for a slice. Carrot cake is my absolute favorite cake, so I can't wait to try this recipe! I thank you for sharing it. I also like to bake cakes around the holidays as well, and always try to do something different when I can. Wonderful post today, Suko! MMM, I love carrot cake so I may have to give that recipe a try! The holidays are all about cookies for me :) And I have no self control when it comes to homemade cookies which is a bad combination. LOL! This cake sounds yummy and I might have to try my hand at baking it!